2. Check with your local utility companies to locate underground pipelines, power lines, or cables. 2. Drive stakes into the ground along property line. Then stretch a string between each stake and extend the string 2' beyond property line. 3.Mark End and Corner post locations with a stake. 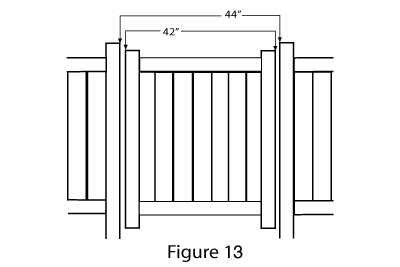 For gate posts, refer to the gate section for gate opening size. 1. Dig all End and Corner post holes first, 10" in diameter and 24" deep. NOTE: Post depth and diameter will be determined by local weather and soil conditions. 2. Insert End and Corner Posts into holes and set them in concrete filling to 2" below ground level. 3. Level and plumb post. 4. Stake a string line across the top of the End and Corner posts, to mark the desired height of the line posts. 5. 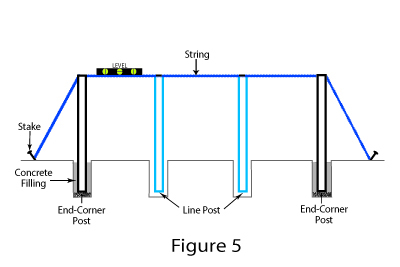 Now stake out the positions of the line posts along the string line. 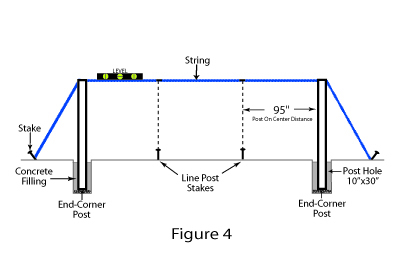 a) You can keep the line posts on 8' centers and position one line post to a smaller distance. This means you will end up cutting one fence section down to size. 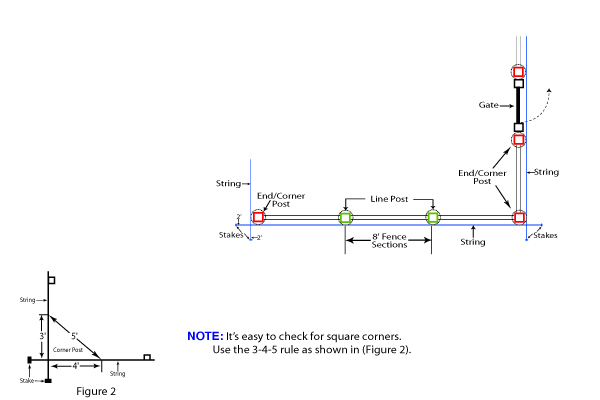 b) You can position all the line posts at a smaller even distance and cut down the width of each fence section. 6. Dig the holes for all the line posts. Repeat Steps 4-6 for all fence lines. 1. Now start installing the Line posts and then the Bottom Rails. 2. Slide the Bottom Rail into the bottom hole of the terminal post. Starting down the fence line, place the next post into the next hole. Now slide the next Bottom Rail into the bottom hole of the next post. 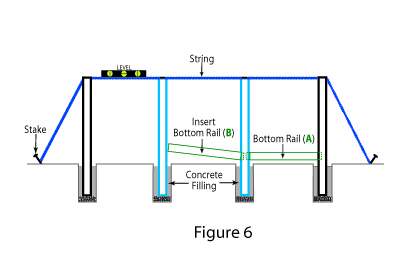 Repeat these steps until all posts are set with bottom rails inserted. NOTE: if the post spacing is less than 8' on center, cut a piece from the end of the top and bottom rails to get desired length. 3. Fill the post hole with concrete. Make sure that the post is set at the correct height, is square, level and plumb with the fence line. All posts require concrete on the outside base. For added strength, End and Corner posts should be filled up to 30" above ground with concrete (i.e. 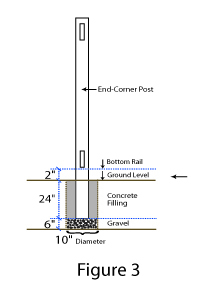 if the post is 8' tall with 2' into the ground then you will fill the post up to 54" of concrete from the under the dirt to 30" above ground). NOTE: Before filling gate posts with concrete, make sure that the gate hardware is installed following the instructions in the gate section. 1. 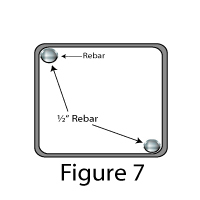 Each end, corner or gate post takes 2 pieces of 1/2" diameter rebar cut 36" shorter than the post length located at opposing corners of the post. 2. Now fill the posts with concrete, tapping on the sides of the post to remove air pockets in the concrete. 3. Clean up excess with water before it dries. 1. Starting on one end, insert the starter picket into the bottom rail. Continue across the panel inserting the remaining pickets and interlocking the tongues and grooves of the pickets. As you approach the end of the panel, insert picket on the opposite post and move towards he center keeping tongue and grove in the same direction. Then slide the last picket in from the top, approximately 2 or 3 pickets in from the post. NOTE: if post spacing is less than 8' on center you can cut the picket board on one side. The cut end always goes against the post. 2. To insert the top rail place one end of the top rail into the post and work your way down the panel pushing the pickets into the top rail as you go. 3. 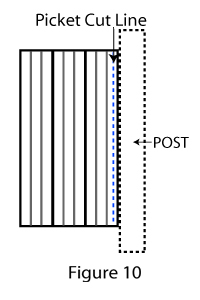 After the last picket is inserted, slide the rail into the post. Repeat these last steps to assemble all the panels. 4. Once you have made sure that everything is square, level and plumb with the fence line, then use #6x3/4" self tapping screws to secure the top rails from the top posts. As the post caps are not on yet you can do this by getting on a ladder and screwing the screws from the inside top of the post, when you screw the screw into the top rail from the inside that will prevent the rail from coming out. 1. 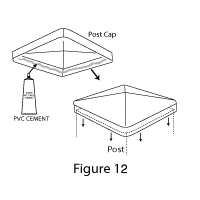 Install post cap on post by applying PVC glue on the inside of the cap. 1. Set privacy fence gate posts 43" apart to allow for hardware and gate. Gates are 41" wide with a 2" gap to accommodate hinge and latch. Set traditional and perimeter gate posts 49" apart to allow for hardware and gate. Gates are 47" wide with a 2" gap to accommodate hinge and latch. For narrower openings, gates can be cut to size. 2. Assemble gate following instructions in Gate Kit. 1. Position gate in the opening by blocking up the gate so that the rails of the gate lineup with rails of the fence. 2. Attach hinges to hinge post and latch catch to latch posts before filling posts with concrete. 3. Ensure that gate posts are filled with concrete and rebar and set 72 hrs before hanging gate. 4. Hang the gate by attaching the hinges to the gate. 5. Position latch bar on gate and secure.